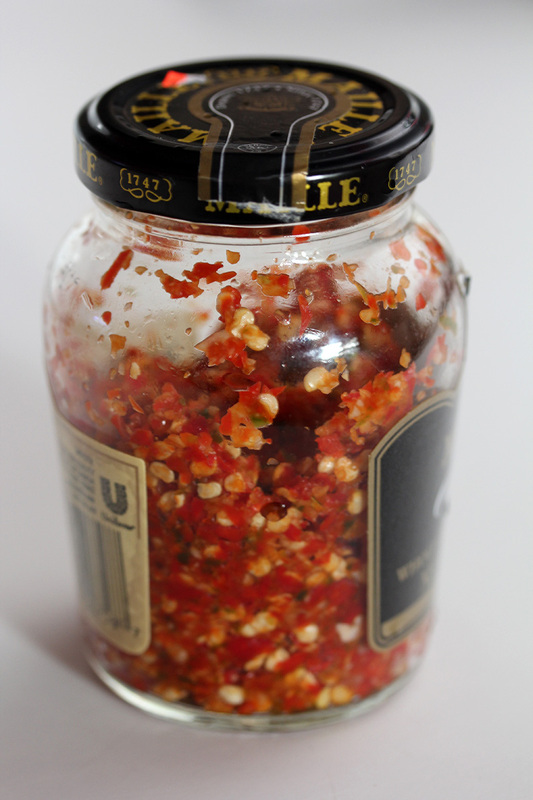 i finally processed the hot peppers i bought weeks ago from haymarket. i got them on a whim and didn't know what to do with them so they sat outside for a while then finally in the fridge. by now they were somewhat dried up, so it was either use them or throw them out. 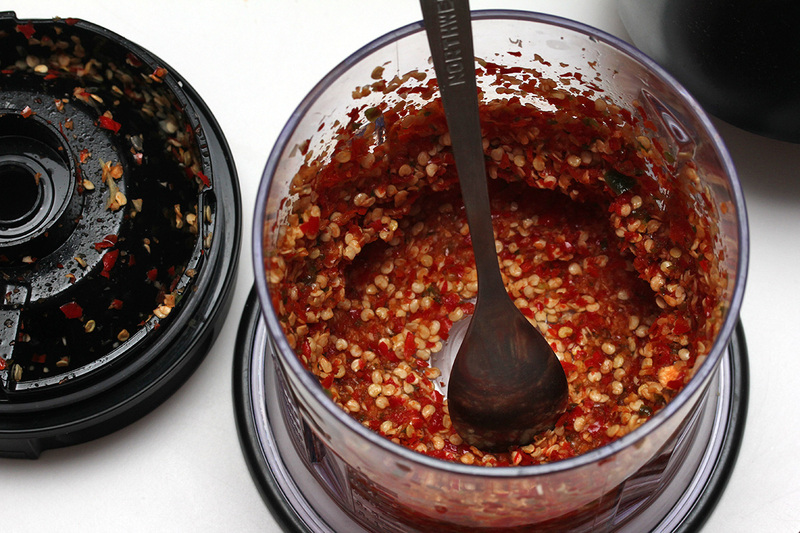 i finally decided to throw them into the food processor and turn them into a hot sauce paste. 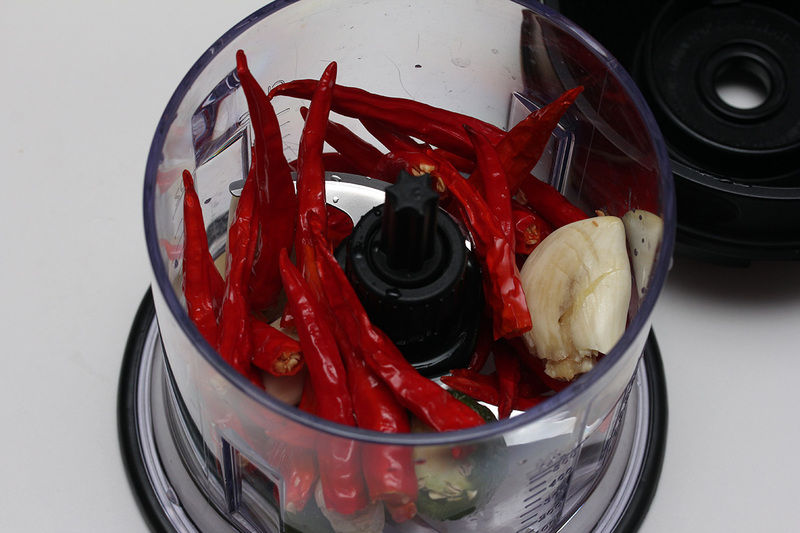 i cut off the stems from the handful of red cayenne peppers and did the same with the one lone jalapeno. i also added a few cloves of garlic, a dash of chinese baijiu, and some salt and sugar. 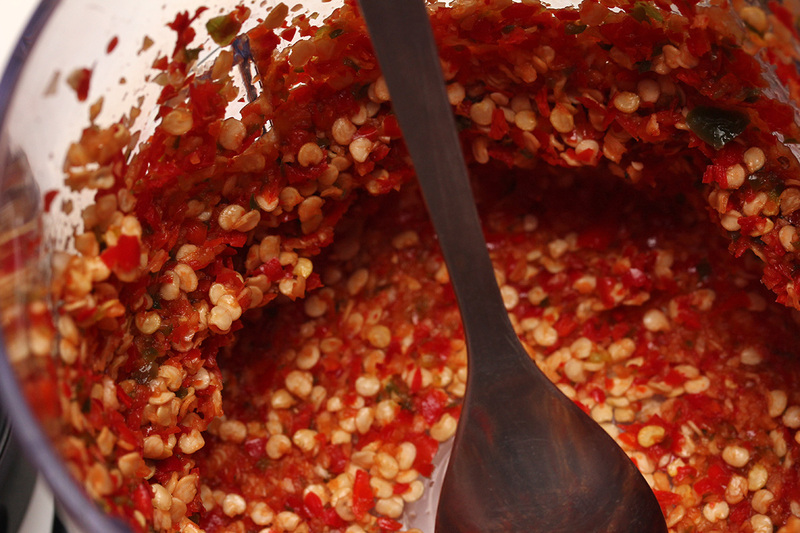 the sauce ended up being a lot of seeds with not too much pulp since the peppers were a bit dried out. there was no way to judge the flavor without testing, and no way to test the flavor without burning my mouth, but at least these weren't habanero peppers. after an initial test taste i decided to add another tsp of salt to enhance the flavor. the final result tasted like a somewhat generic but very spicy hot sauce, maybe the flavor will get better once it's had some time to ferment. i will give the jar of sauce to my mother, the ultimate connoisseur of hot sauces. 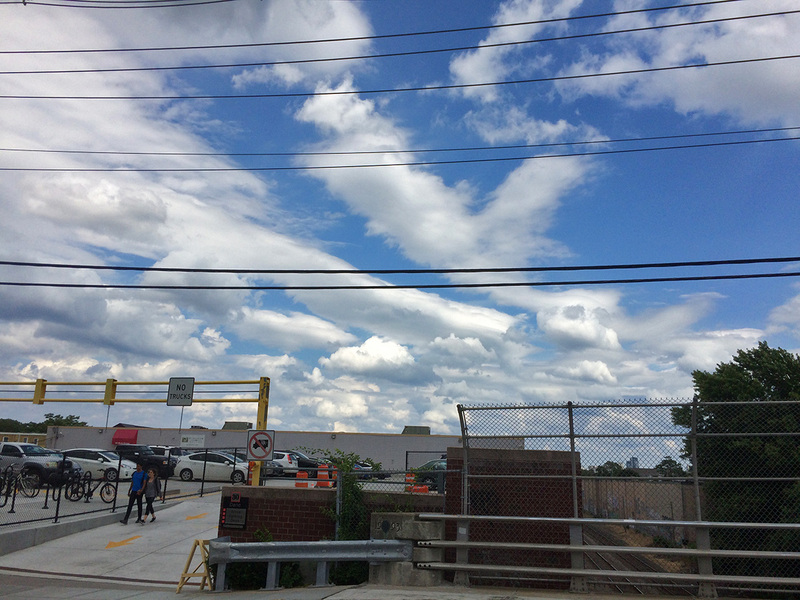 i left for a grocery run in the afternoon, trying to beat the arriving rainstorm scheduled to get here at 3pm. i went to get my trek utility bike and noticed that the back wheel was completely deflated. judging from the marks on the tire, i might've even been riding on a flat tire without realizing it. after pumping up the tube, i set the bike upside down to try and find any punctures, which would be the only explanation as to why the tire would deflate so much. however i couldn't find any damage and the tire seemed to be holding up well again, didn't go soft. i decided to ride with it and see. i went to the community garden first to water my plants. 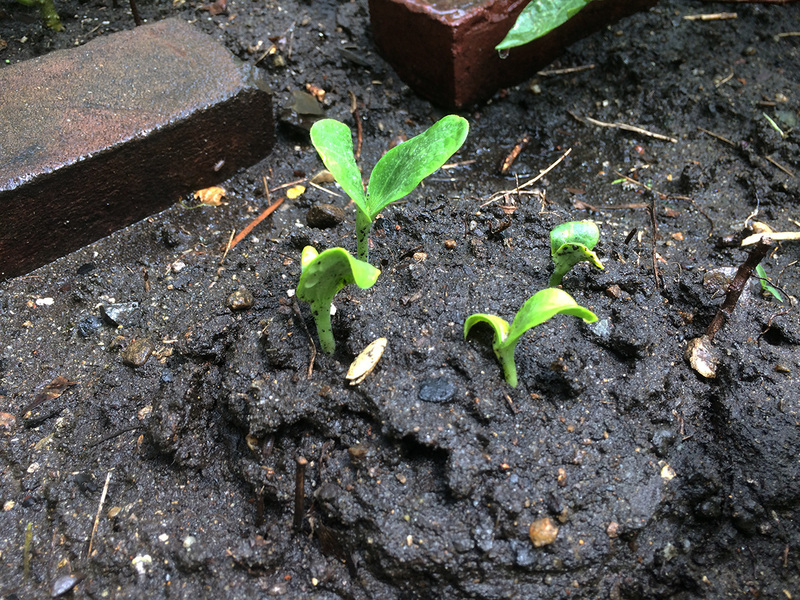 all the vegetables seem to be doing well. 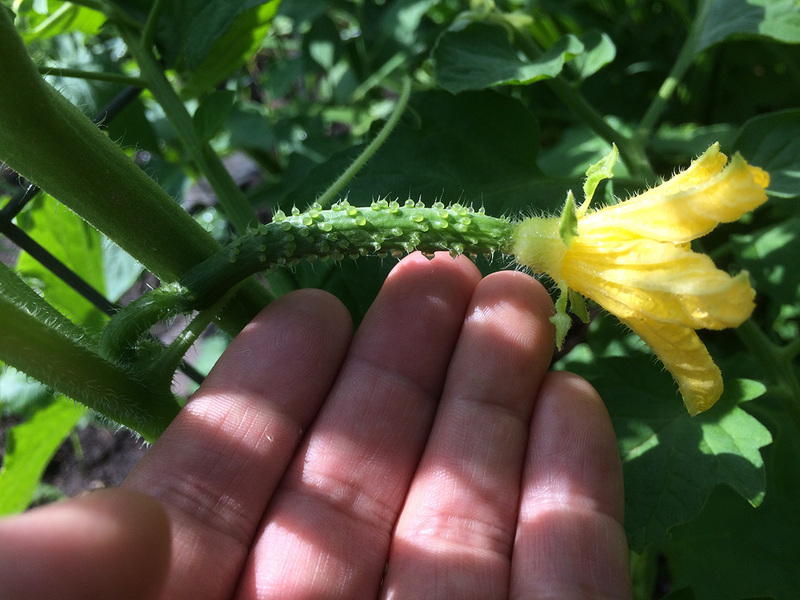 i found a small immature cucumber, hopefully it can develop into a mature fruit. 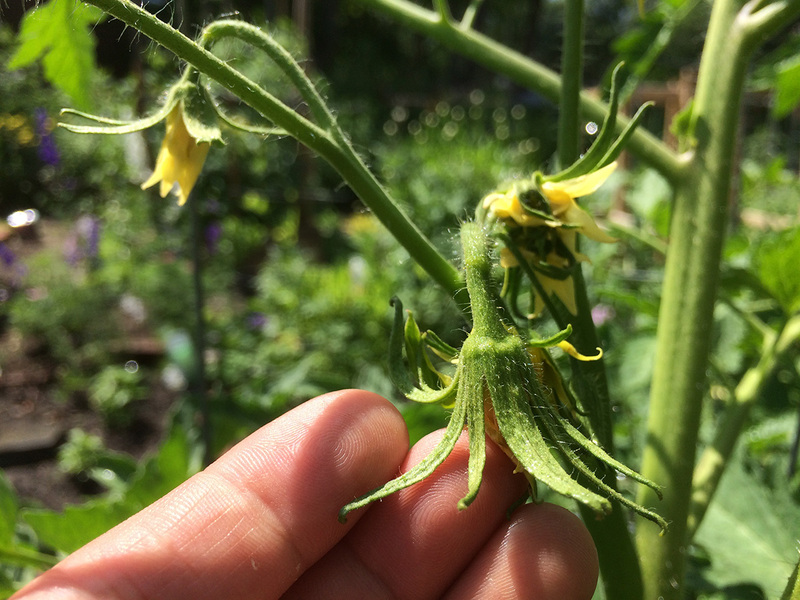 one of my tomatoes has unusually large flowers, which maybe means unusually large tomatoes down the line. 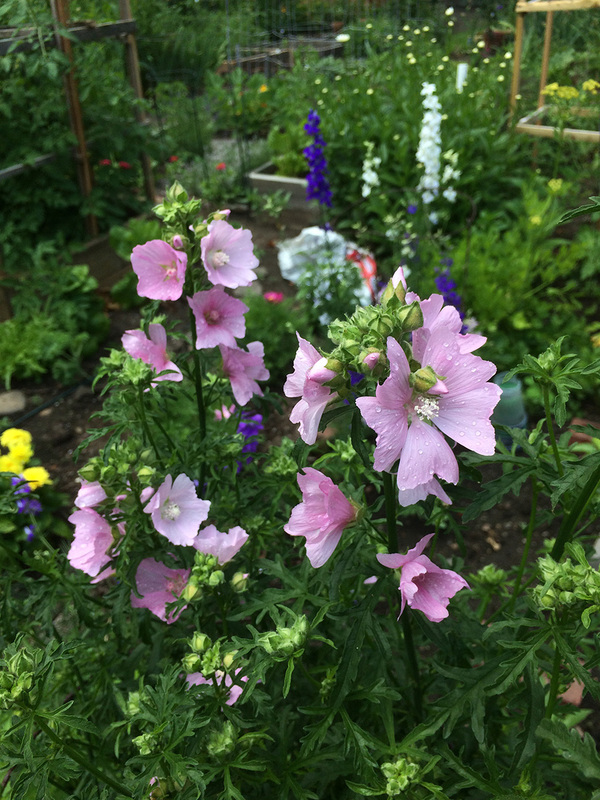 the larkspurs were putting up more of a color show, with whites, violets, deep purples, and pinks. 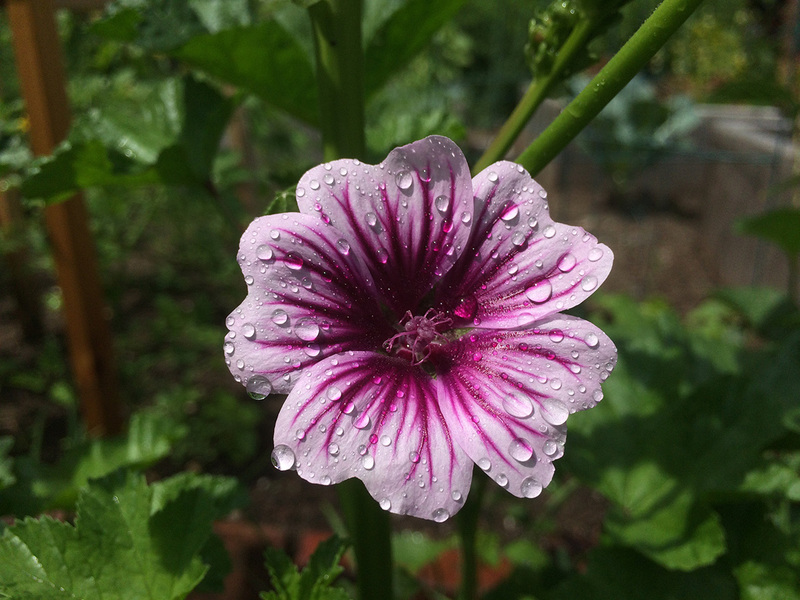 but the thing i was most excited about seeing was the flowering of my very malva zebrina. as i noted a few days ago, the plants themselves are not very tall - maybe 2 ft high - but there are many flower buds and hopefully it'll put on a long show. 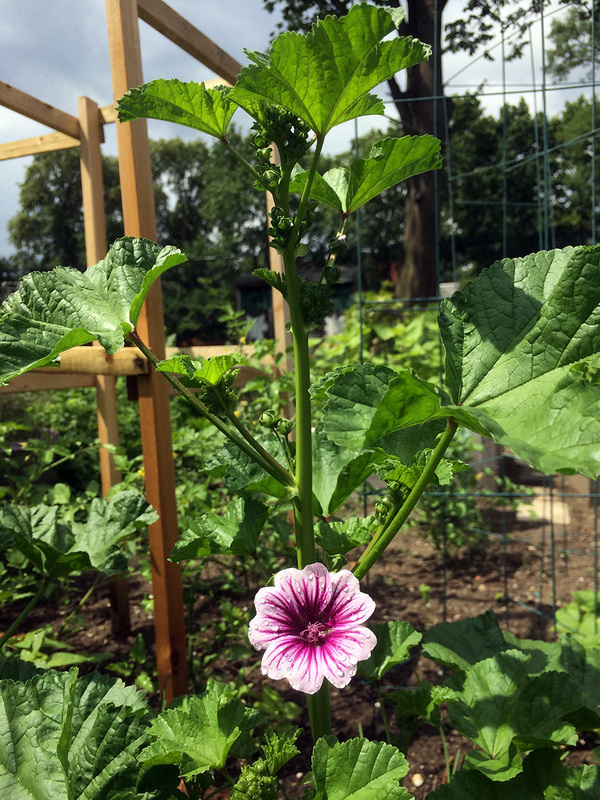 so far no insect pests, which is good, as these hollyhocks tend to attract a specific type of weevil invaders. 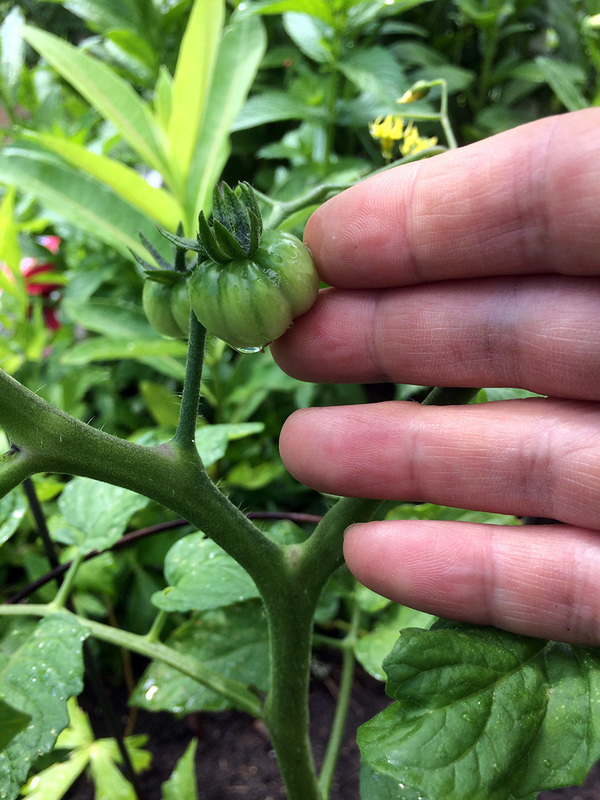 i am the only gardener who's growing them and i wonder if other gardeners have noticed. they will look more spectacular once more flower buds open up. the rear tire held up as i rode to market basket, no noticeable signs of deflation of any kind. i wonder if it naturally slow deflated and i just never noticed, but i still think it's a puncture and will need to check on the tire tomorrow (it might take more than a few hours for the tube to go flat). 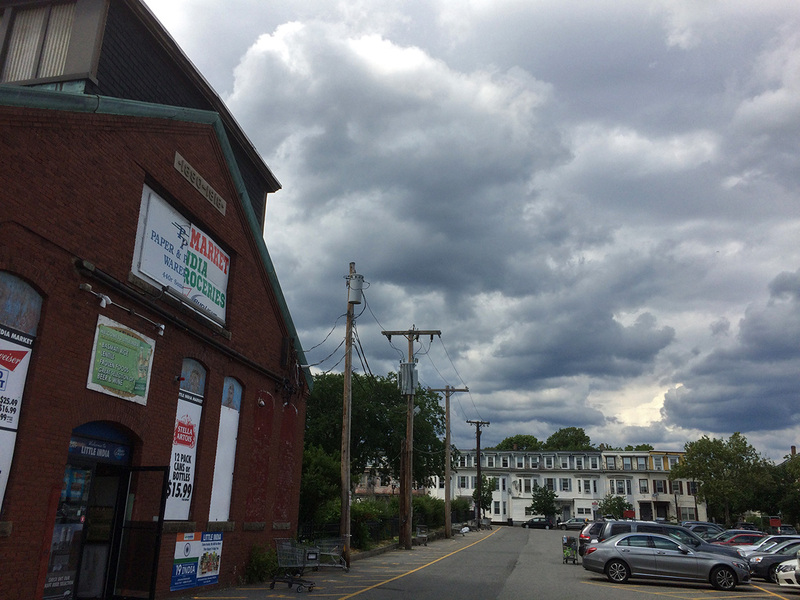 even though it was sometime after 3pm it didn't rain yet but the sky looked threatening, with all sorts of looming clouds. i was at the supermarket primarily to pick up some chicken thighs for my attempt at making general tso's chicken for dinner. there was a manager's special sale of $1.60 for nearly 2 lbs. of thighs. why the recipe asked for thighs instead of breast meat i don't know, but i wasn't complaining about the price. despite needing only one ingredient, i still left with about $20 worth of groceries after stocking up on some canned seltzer and a package of chicken sausage. GC got home relatively late today. i was expecting to see him around 5:20pm, since that was the time he came home last week, but he didn't get back until 6:20pm. i know his boss is away at a conference in prague and wouldn't return until after the 4th of july holiday, so GC's even more unsupervised at work. soon after he got home he started making dinner. tonight it was beef noodles, which has zero stink. i didn't begin my adventure with general tso's chicken until almost 7pm. hopefully i would have everything cooked by 8pm primetime television watching hour. i actually learned of the recipe from an animated gif i found on reddit. it took a while to transcribe the list of ingredients as i couldn't pause the gif. finally i ended up downloading the gif file so i could scrub the playback to collect the final few ingredients. there was nothing on that list that i didn't already have at home besides the chicken thighs. earlier about 5:30pm i'd already prepared the chicken. perhaps thigh meat has more flavor, but it's not easy to work with, as i had to debone the 4 pieces of thigh and remove the skin. i'm guessing by the end i only had about 1 lbs. 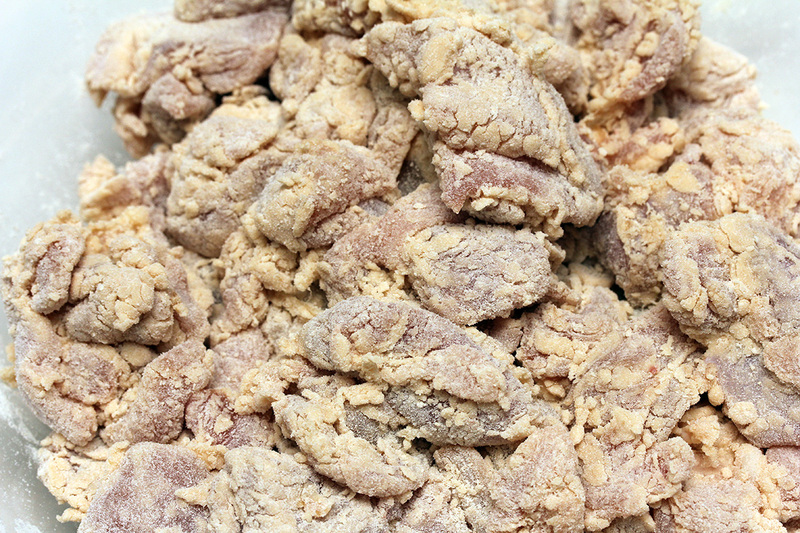 of actual chicken meat, which is actually the portion recommended in the recipe. into a bowl i added the chicken and the marinade, which was simply 1 cup of rice wine (i had a really old bottle i couldn't wait to use up) and 1/4 cup of soy sauce. into the fridge everything went. general tso's chicken involved a little bit of frying, which i didn't like to do when my roommate is around because i didn't want to give him any ideas that frying is an acceptable form of cooking. i did some gentle frying however, with enough vegetable oil to only fill up 1/3 of the medium-sized pot to minimize splattering (it was leftover oil from karen anyway, and that was all that i had). 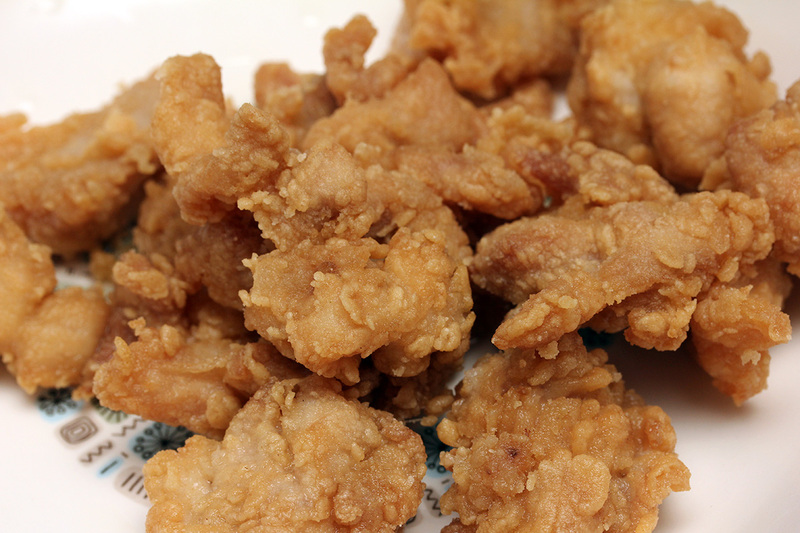 i coated the chicken in batter, which was also a simple combination of 1 cup flour with 1 tbsp of salt. the batter didn't seem to coat very well but still acceptable. 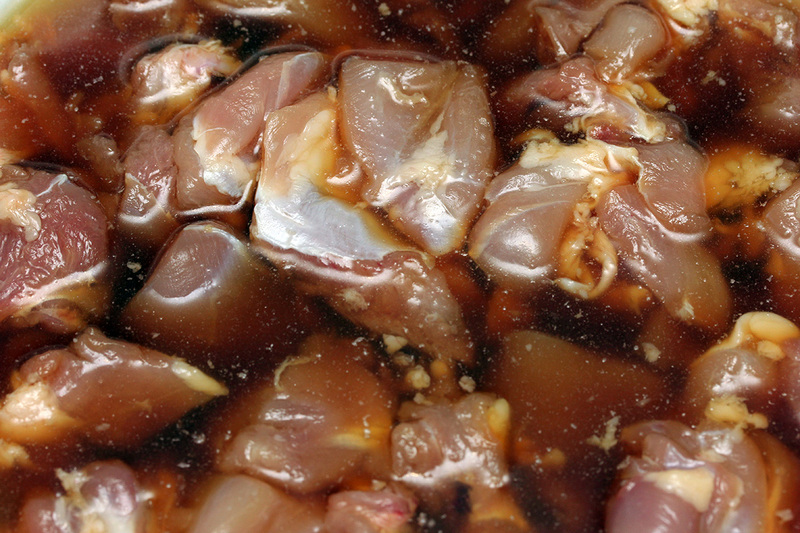 into the hot frying oil went the chicken, in small batches of thirds. 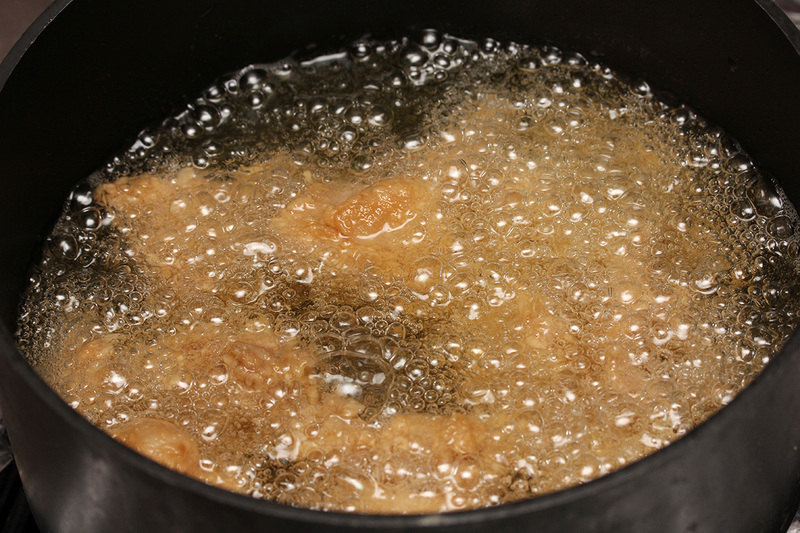 i'm always afraid of frying, from the mess it can make, to the smells, to the danger of cooking with hot oils. this time around it wasn't mess, just a little smattering of splatter which i easily wiped with a paper towel, and there wasn't any smell because i never got the oil hot enough that it was smoking. 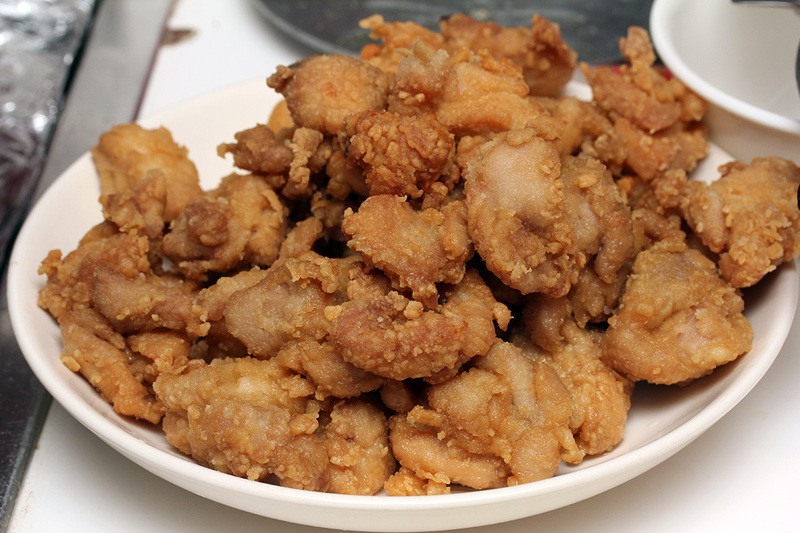 the fried pieces of chicken looked like nuggets of fried clams. i tasted a small piece, it was delicious, good enough that i would eat these fried chickens on their own. however they were a little salty, probably from the tbsp of salt in the batter and the soy sauce marinade. also while all this was going on, i was cooking up 1 cup of jasmine rice in the rice cooker. 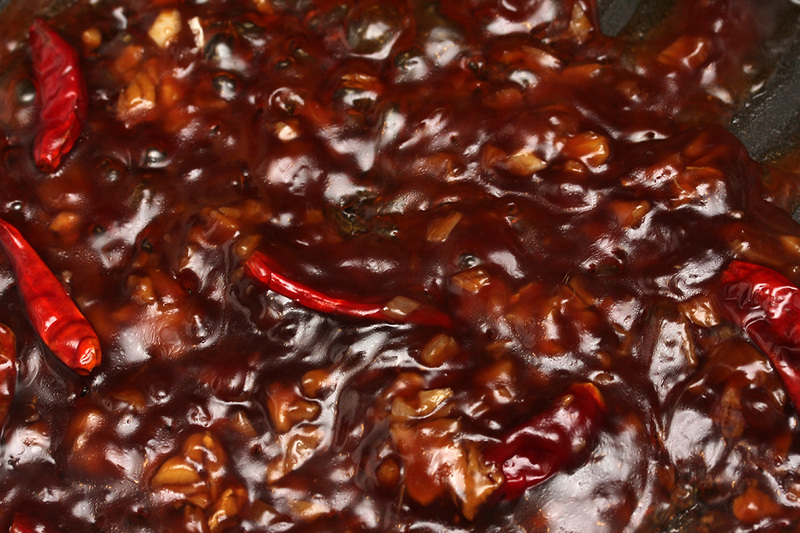 next came the general tso's sauce. frying the marinated chicken already takes it up a level, but add the sweet and tangy and spicy sauce and we're off the charts. GC - who was watching me cook the whole time - let me have some of his dried hot peppers. 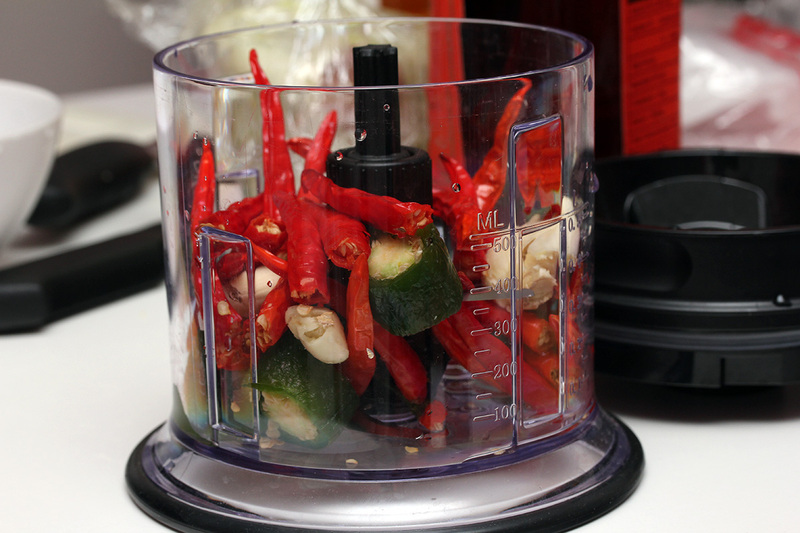 i was going to use some frozen thai chili peppers from the freezer, but the dried peppers were more authentic. i could've used a lot more, but only used 7-8 peppers because i didn't want to exhaust GC's supply, which he told me he brought from china 6 months ago. 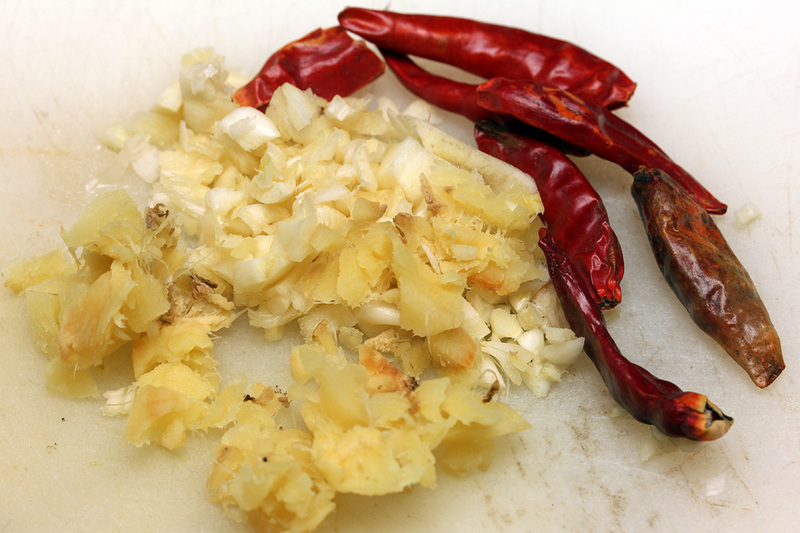 i sauteed the chopped garlic and ginger and hot peppers first, before adding the rest of the ingredients. the sauce seemed too liquidy, even after i added the sugar. it was only when i poured in the corn starch slurry did the sauce suddenly thicken up. at that point i dumped in the fried chicken and mixed everything together. viola! 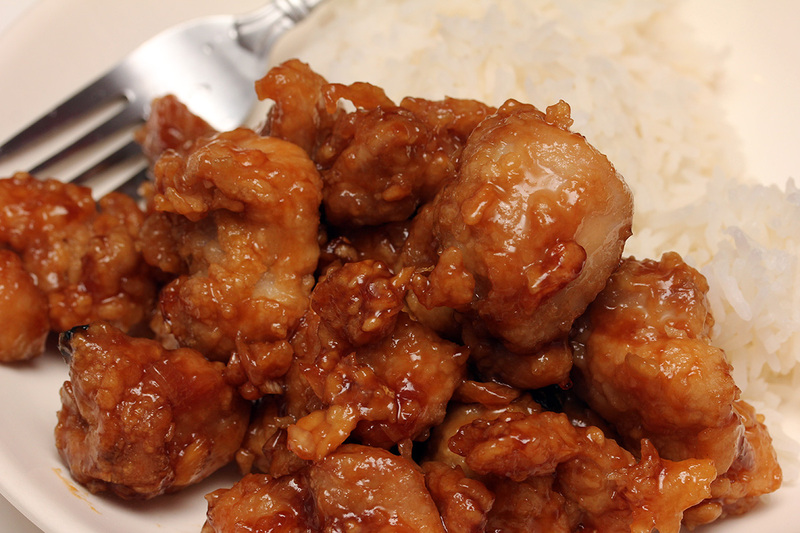 general tso's chicken! of course GC had never heard of general tso's chicken before, but he did search the name online and recognized who the general was in chinese history. 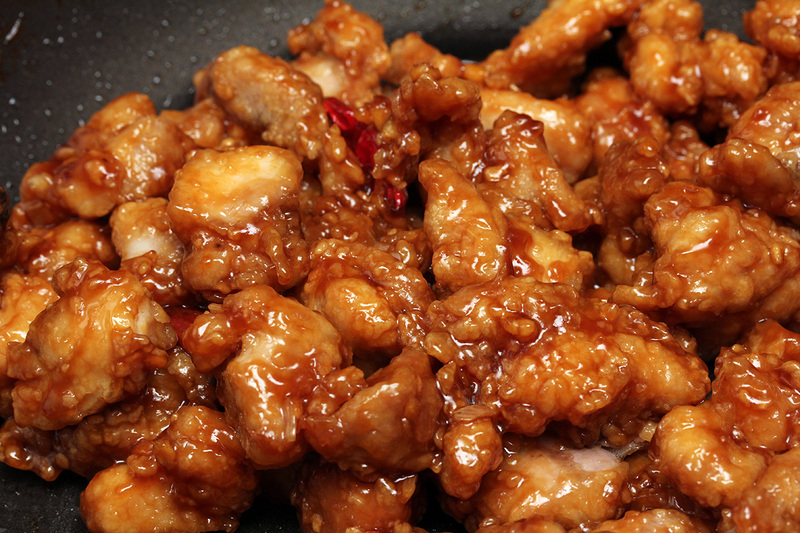 general tso's chicken is entirely an american chinese food tradition. since GC already had noodles for dinner he wasn't in the mood to eat more, but tried some of the chicken. he said it tasted pretty good. i tried a piece myself. very tender, crispy, well-cooked, but the sauce was less sweet and more salty and vinegary. also no spiciness, as i feared the hot peppers weren't nearly enough. still, not bad for my first attempt at general tso's chicken. it's actually pretty easy, the only hard part is the frying and even that wasn't too bad (though seemed like a waste of good oil, even though i did save it after it cooled, maybe for a future fry). i paired the chicken with rice and nothing else (not even scallions or sesame seeds to garnish). we ate in the living while watching a PBS documentary on the history of the chinese dynasties, starting with the song and finishing with the ming. GC brought out his cherries, told me we should eat them before they go bad, i brought out my green grapes. afterwards we watched a general tso's chicken documentary on netflix, which was the perfect way to end a meal of general tso's chicken. GC didn't believe me when i told him how pervasive the dish was in american chinese restaurants, until i showed up a bunch of chinese takeout menus and every one of them had general tso's chicken. GC also told me something tonight that i didn't know: he doesn't use soap when he takes a shower, unless it's a day where he's been exercising and sweating a lot. he also told me he prefers staying in the house than going outside. the documentary didn't end until close to midnight. GC said he was going to take a shower (without soap) which means i didn't see him the rest of the night as he always goes straight to bed afterwards without saying good night. only then did i finally have some time to myself to work on the weblog and even then it was just to post a few photos.